Join us this concert season to celebrate music in Alameda! The Alameda Community Band is composed of volunteers from Alameda and surrounding areas. Members have varied musical backgrounds and are dedicated musicians who have a common interest in playing music and improving their skills while having fun. 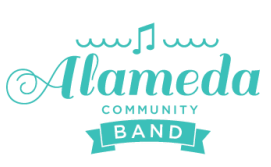 Join the Alameda Community Band! New members are always welcome. Anyone who loves to play music can join under the link below. Rehearsals start in January at the Encinal High School Band Room.